A marinated fillet steak is definitely on my desert island menu. Whenever I go home, one of my biggest treats is when my dad cooks a perfect steak, accompanied with good but simple vegetables. I think it should be almost rare in the middle, but everyone has their's differently. You can marinade these in advance and cook each one to your guests liking. Top tip: If you don't know a good butcher, it's a good idea to buy from a meat counter so you can see what you're actually buying. 1. Peel and crush the garlic, and smother all over the steaks. Place in a dish and pour on the soy sauce. Roll the steaks in the soy sauce and then drizzle on the olive oil. Season with salt and pepper. Leave to marinade in the fridge for at least 30 minutes (the longer, the better!). 2. Peel and roughly dice the sweet potatoes. Place in a pan of boiling, salted water and boil until soft. 3. Drain the water off, and mash in the cream cheese and butter. Only add milk if you need it to be even creamier! Season to your taste with salt and pepper. 4. If you have a good non-stick pan you shouldn't need any extra oil to fry the steaks. Heat your frying pan till hot, and then quickly fry the steaks. My rule of thumb for medium rare steak is 4-5 minutes on each side. Serve immediately, with a dollop of the creamed sweet potato, and your prefered vegetables. 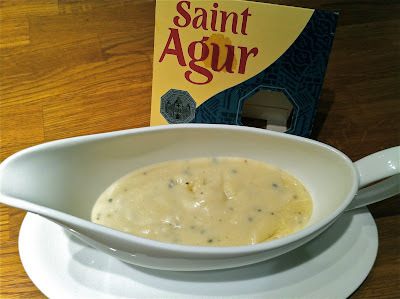 For even more flavour why not try a drizzle of my Blue Cheese Sauce on your steaks? Pâté...mmmm...pâté!! Who doesn't love a lovely bit of pâté? Smooth, rich and creamy, perfect with some toasted bagels, or melba toast! Lasts for ages, if you seal with butter! Pâté is in fact quite simple to make and gives you loads of artistic license, and once you know the basics it can be quite forgiving. 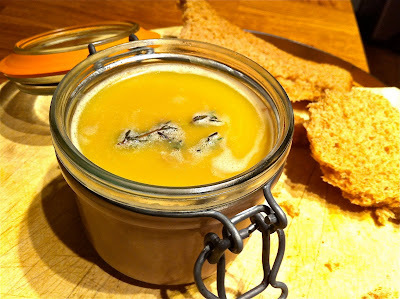 So have fun with this one, my basic chicken liver pâté recipe. Top tip: Looks great in a Kilner Jar, both as storage and serving in. Why not tie a ribbon round to make a culinary gift? 1. Dice the shallots. Peel and crush the garlic, and sauté them in 25g of the butter on a low heat until softened. 2. Add the whole chicken livers and the thyme leaves to the pan, and cook until the livers are browned all over, but still pink inside. 3. Remove everything from the pan, and place in a food processor. Add the brandy, port and double cream and liquidise until close to smooth. 4. Strain the mixture through a sieve into a jar or dish. 5. Melt the remaining butter, and carefully decant the top layer of clarified butter, being sure to leave behind the white milky layer. Pour the clarified butter on top of the pâté. Place a sprig of thyme in the center of the butter, and place in the fridge till set. Serve in the jar, or in plated portions, with some toasted bread and chutney of your choice. My favourite order from a takeaway has always been spring rolls. Having tried various restaurants, I've found they can be quite hit-and-miss, so I've come up with my own version of this classic recipe. Guests are always impressed when these are served, and often can't believe they're home made. Top tip: You can use Filo pastry, but if you have access to an oriental food market I really recommend buying authentic spring roll pastry sheets. Vegetable Oil - enough to fill a wok by about 4cm. 1. All the vegetables need to be in long thin strips like matchsticks. Slice the mange tout, sweetcorn and trimmed spring onions. Peel and slice the carrot. Finely chop the coriander. 2. In a pan over a medium heat stir fry the sliced vegetables (not the spring onions) in a tablespoon of the oil. Add the bean sprouts and prawns and heat through. 3. Finely grate the ginger and stir in. Finely chop the chilli, discarding the seeds, and add to the pan. 4. Remove from the heat and grate in the zest of the lime. Add the coriander, fish sauce, and lastly the spring onions. 5. To make the spring rolls, cut a square of pastry, roughly 12cm squared. Add about a tablespoon of the vegetable and prawn mixture to the center of the square, and fold over diagonally to make a triangle - the mixture should be in the middle of the long fold. With the fold edge nearest you, fold in the right and left corners (it should look like an open envelope at this point). Ensuring the mixture stays in the middle roll, towards the far tip of the pastry. Repeat until all the mixture is finished! 6. Fill the wok with oil to about 4cm depth, and heat until the surface is rippling, but not boiling or smoking! 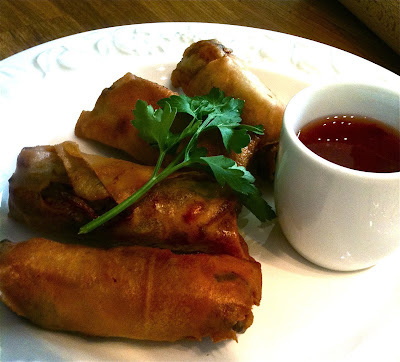 Deep fry the spring rolls in batches, and remove with a slotted spoon once golden and crispy. Serve hot or cold with sweet chilli dipping sauce or soy. This is a great dish to know because it can be thrown together in advance to produce as a main, starter or picnic accompaniment. It looks impressive, and tastes great but actually requires vey little culinary skill!! Top tip: If you're not a big spice fan, then use a green chilli, or add a teaspoon of sugar to the dressing to take the heat out. 1. Cover the king prawns in the sweet chilli sauce, and grill under a medium heat for 8-12 minutes until covered in a sticky glaze. 2. Meanwhile, slice the baby sweetcorns in half from tip to base. Halve the cherry tomatoes, and slice the mango into thin slithers. Roughy chop the coriander. Finely chop the chilli, making sure to discard the seeds. 3. Now prepare the dressing: mix together the juice of one lime, the fish sauce and the chilli, and then grate in the ginger. 4. 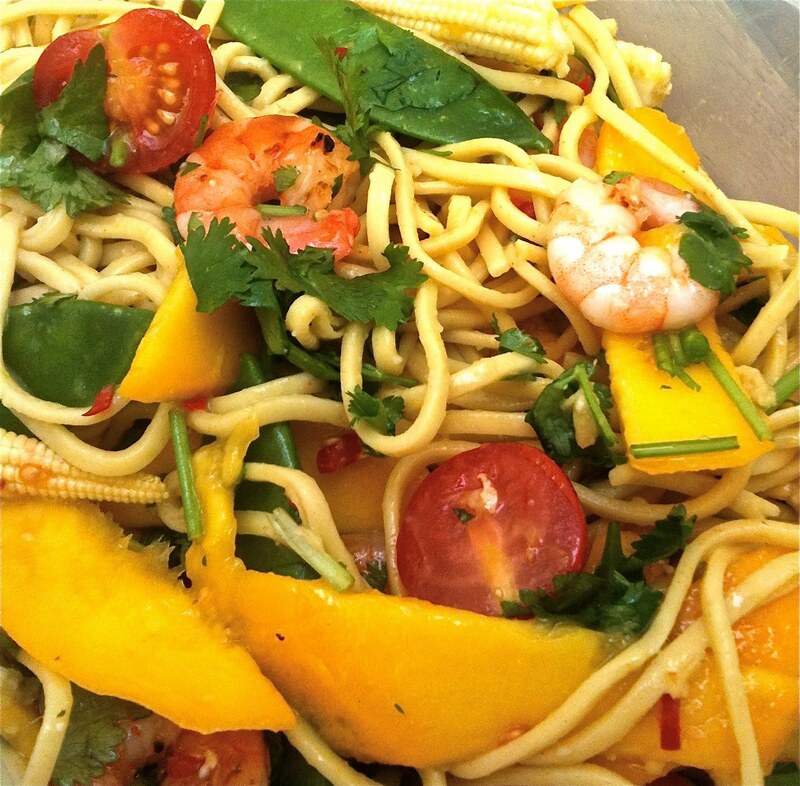 In a salad bowl toss together the noodles, prawns, vegetables and coriander. Stir the dressing through. This is a basic, quick and easy sauce which can be made in minutes to serve warm with a good slice of steak. It's rich and creamy, but not too strong. Top tip: Don't add any extra salt, the blue cheese will do this for you! 1. Melt the butter in a saucepan. Sieve in the flour. Stir and cook on a medium flame for roughly two minutes. 2. Add a small amount of the milk at a time, stirring constantly until thick and creamy. Add boiled water to dilute to desired consistency. 3. Crush in the garlic, and add the pepper. Mix well. 4. Crumble in the blue cheese and heat through on a low heat until melted. Keep tasting, and add more cheese until it tastes cheesy enough for you! Serve warm. 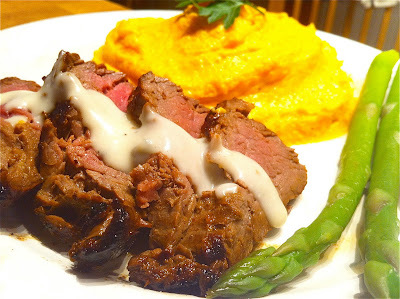 Try it with my Marinated Fillet Steak & Creamed Sweet Potato. For my birthday my friends very kindly paid for me to go on an Italian Butchery course (more recipes later!). After an amazing evening dissecting and eating our various meats, I decided that I was craving something light with vegetables, without meat, so I came up with this! 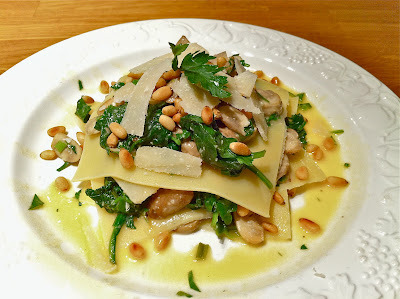 The simplicity of this is it's elegance; with the woody pine nuts and earthy mushrooms, it's delightful on the palette and easy on the stomach. Top tip: For a meaty version, simply layer in some parma ham. You can also tart this one up by using exotic mushrooms, truffle oil and fresh egg pasta. 1. Slice the mushrooms and sauté in a pan with the butter. Crush in the garlic. 2. On a low heat, add the spinach and allow to wilt. Once wilted, stir in the chopped herbs (coriander, parsley and chives). 3. Toast the pine nuts in a separate dry pan over a low heat and keep them moving. After only a few seconds they'll start to brown and smell delicious. Remove them from the pan immediately, or they'll burn! 4. Boil some water and cook the lasagne sheets until al dente. Once done, cut each sheet in half. 5. To construct the lasagne, place half a sheet on your plate and add some of the spinach and mushroom mixture. Next roughly scatter a few of the pine nuts and add a couple of parmesan shavings. Re-layer three times, leaving the top layer open. Add more parmesan and pine nuts to the top layer and surrounding dish. Serve cool or at room temperature, with a drizzle of my warm Hollandaise Sauce. Not being a fish lover, I was late to catch on to this one, but actually with green vegetables such as spinach or asparagus this can be such a lovely creamy, buttery accompaniment. 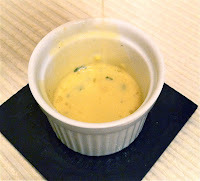 This Hollandaise sauce can be quite difficult to get right, but once you've got the nack you can make it your own by adding your favourite herbs and seasoning to your taste. Below is the basic recipe. Top tip: It is very important to keep the mixer going whilst adding the ingredients. 1. Pour the white wine, lemon juice and vinegar into a small pan. Add the bay leaves whole, and then the black pepper. 2. Reduce over a low heat to about a quarter of the original fluid quantity. Once done remove the bay leaves. 3. Melt the butter in a separate pan. 4. In a food mixer whisk the egg yolks. Add the cold water, and gradually, whilst constantly mixing, add the reduced mixture. Next gradually add the warm butter. 5. Finally, stir in the freshly chopped parsley. Add salt and pepper to taste. Serve warm to accompany fresh green vegetables (e.g my Wilted Spinach & Mushroom Lasagne). This is one of those grandmother's recipes where I believe 'chinese whispers' has taken over as it was handed down over the years. I never wrote it down, and can't remember the original recipe but this version is something I'll probably hand down to my grandkids for them to adulter! It's very simple to put together as it contains a lot of cheats, and perfect for a hearty Sunday evening meal. 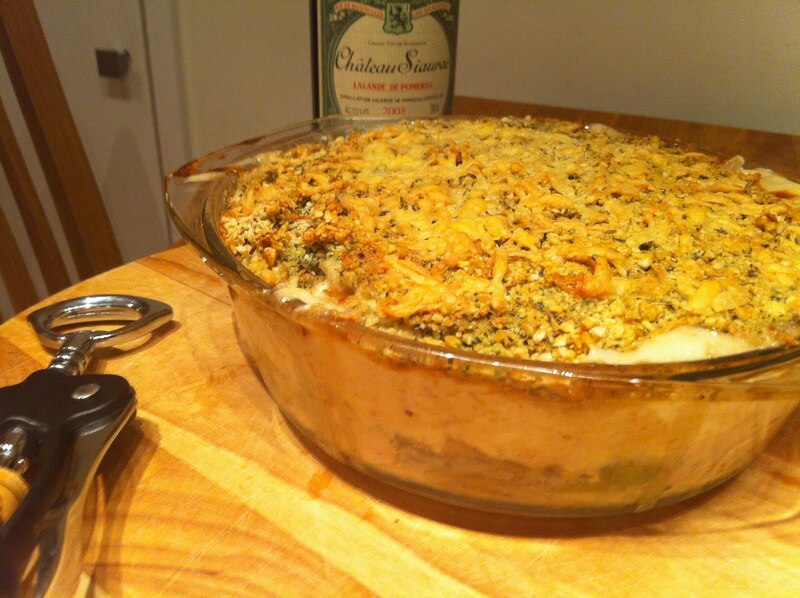 Top tip: For the crunchy breadcrumb topping my ultimate cheat is to use Lemon & Parsley stuffing mix dry. You can make your own breadcrumb mix with fresh breadcrumbs, lemon zest, salt & pepper and nutmeg, with optional herbs. 1. Slice the leeks and mushrooms and sauté in a pan with the butter until softened but not browned. Add salt and pepper and remove from the heat. 2. Dice the chicken, and coat with the nutmeg. Mix the raw chicken with the leeks and mushrooms and transfer to a casserole dish (about 12 inches). 3. Mix the mascapone and condensed mushroom soup together. Spread the mixture over the top of the chicken. 4. Sprinkle a sparse layer of grated cheddar cheese on top, and then a layer of dry stuffing mix. At this point, whisk the egg and as roughly as possible brush over the stuffing layer. Finish with another sprinkling of cheddar. 5. Pop into a pre-heated oven at 200 degrees Celsius for 35-45 minutes, until the chicken is white and the topping has browned. Serve with fresh green vegetables or boiled new potatoes. Summer for me means numerous barbeques on the beach, and therefore the endless mission to perfect the quintissential burger. Juicy, tender and well-seasoned; but these come with an extra surprise - an oozy, melty blue cheese filling! 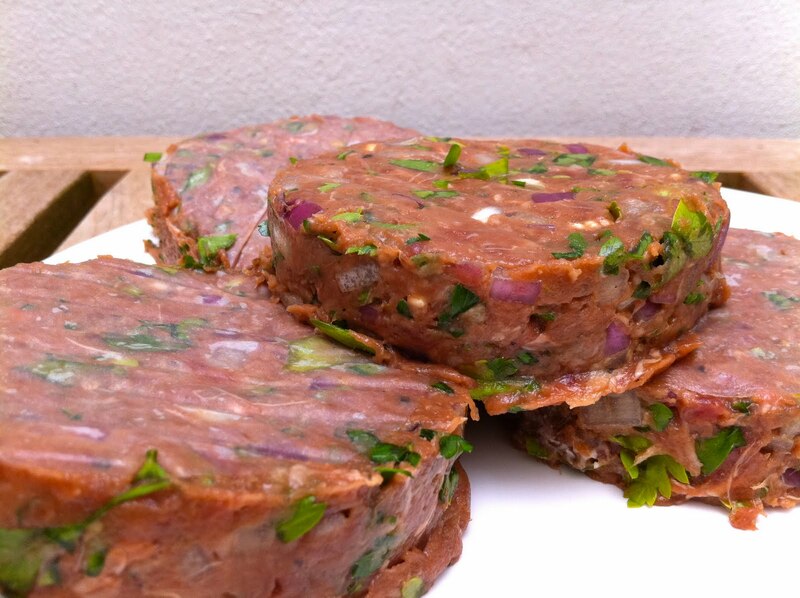 Top tip: Fresh herbs should always be used over dry herbs in these burgers. A burger press makes everything easier, and gives a professional finish. 1. Finely dice the red onion and chop the parsley. Peel and crush the garlic cloves. 2. Place the beef mince in a large mixing bowl. Add in the garlic, onion, parsley, cumin, soy sauce, worcester sauce and egg to the mince. 3. Knead the mixture with your hands, until thoroughly mixed through. Add plenty of salt and pepper to season. 4. The mixture will be quite sludgy, so sieve in a little plain flour at a time and knead until the mixture becomes dryer and a little sticky. 5. Divide the mixture into eight equal portions. Make eight round patties, either using your hands, a cookie cutter or a burger press. 6. Onto four of the patties crumble the blue cheese, and press into the center to form a disc, leaving 1cm from the edge all-round. Place the remaining patties on top and seal the edges by compressing them together. Place in the fridge or freezer until needed. Serve shallowed fried until well-browned on either side, or on the barbeque with friends.